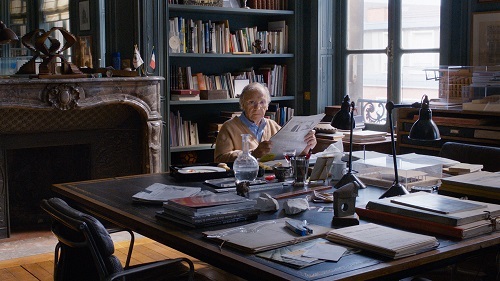 Happy End is about a woman named Anne Laurent (Elle‘s Isabelle Huppert) who has taken over the running of her family’s construction company from her eighty-year-old father, Georges (Jean-Louis Trintignant from Amour). As she is busy dealing with a catastrophic workplace accident that was caused by the negligence of her foreman son, Pierre (Franz Rogowski from Victoria), the ex-wife of her brother, Thomas (Amélie‘s Mathieu Kassovitz), is mysteriously poisoned and his daughter, Eve (Fantine Harduin from Fanny’s Journey), is forced to move in with the family. As the tribe works its way through its trials and tribulations, Eve and Georges discover that they both have something sinister in common. If that all sounds confusing, that’s because it is. Written and directed by Michael Haneke (Funny Games, The White Ribbon), Happy End is a strangely paced film. It’s almost episodic in nature, with each family arm dealing with its own problems, intertwining and interweaving, but never really connecting. And the biggest problem with the film is that it frustratingly hints at connecting all the dots by the end, but fails to do so satisfactorily, leaving the audience to wonder “what now?” once the credits are rolling. 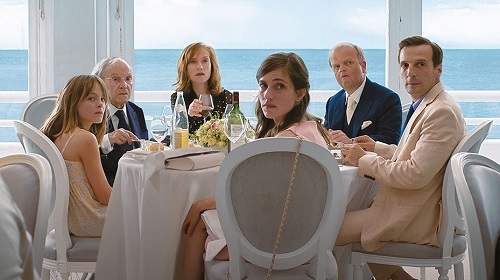 Michael Haneke is an interesting filmmaker, and Happy End is an interesting movie. Haneke basically lets his actors take the lead in a very natural and organic way, and the talented cast put forth very good performances. The plot is, however, so convoluted that the viewer gets a bit confused and disoriented with all of the secondary characters and tangential storylines. Happy End is the kind of movie that would probably benefit from a repeat viewing, so if you’re going to see it, maybe plan on seeing it twice? Michael Haneke pushes the stylistic envelope with Happy End, which is one of the main draws of the film. Photographically, it’s shot in a cinema vérité way, the camera becoming a fly on the wall during most of the scenes. Haneke lets the situations unfold in long, music-less takes with very sparse cutting where the action is allowed to happen by its own hand. Just to keep things interesting (and to illustrate the cultural differences between youth and age in the film), Haneke shows some scenes through what looks like an iPhone camera, and others through security footage, all of which keeps with the distant casual observer theme of the film. Overall, Happy End feels more like an exercise in minimalistic editing than it does a finished movie. Which was probably Haneke’s intention, and while it doesn’t help the narrative of the film much, it makes for an interesting looking movie.